German Import | PART 1 OF THE TRILOGY DIE AESTHETIK DER HERRSCHAFTSFREIHEIT. The aesthetic dimension of this first volume is that of immediacy. This is made plain by the choice of the recording techniques used (throughout the entire production, Jerome Reuter used only analogue equipment) and the raw and unrelenting sound. It sings the praises of the birth of a revolt, born out of a fascination with action and resistance in itself. It is the pride in self-determination, of resistance, because to resist means giving destiny a form (Camus). 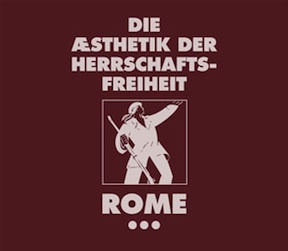 However, ROME does not present art which only devotes itself to efficiency: the music remains too experimental, too difficult to decode for that to be the case. “Free man, you will always love the sea” (Baudelaire): as is so often the case with ROME, the poetry of the sea (‘The Merchant Fleet’) crops up again here and there. The liberation and/or libertarian movement was never a coherent movement, because it never wanted to be a matter of demands, but of life (Landauer). Its nature is manifold and contradictory. Its essence is of freedom, therefore it can never be uniform. This finds musical expression on AUFBRUCH in the multifaceted, stylistically-differing arrangements: from haunting sequences reminiscent of audio books, to plaintive ballads and experimental industrial collages – everything is represented here.